As well as practical service they have also provided valuable advice and support to H4H staff who are dealing with these cases every day. H4H will be engaging AJCM to deliver training to their staff in the near future. Head of Welfare and Clinical Services, Help for Heroes. “I have had experience of AJCM in two personal injury cases in which I acted as a neuropsychological expert witness for the Court. Both were complex circumstances and the Claimant had a very high level of need. 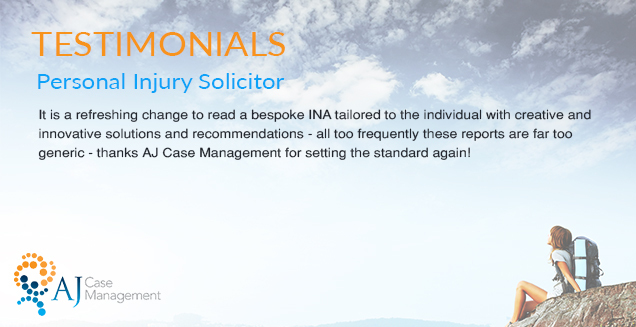 In both cases I was extremely impressed with the quality of the case management provided by Ali McNamara. She assembled a very well qualified team of therapists and associated experts as well as a care team of outstanding ability. All worked enthusiastically and creatively in a dedicated and professional manner for the benefit of their client. These teams were well-integrated and truly multidisciplinary and I have no doubt that their efforts contributed significantly to the rehabilitation and further care of the individual with whom they worked. “I am an Independent Speech and Language Therapist with 28 years’ experience. I specialise in working with people who have impaired communication and swallowing as a result of an acquired neurological disorder such as acquired brain injury and stroke. “I feel very privileged to be part of a well-trained and dedicated team working for an amazing client under the umbrella of AJCase Management. I have been with this package nearly four years. Right from the start we had intense training and team building that was an amazing experience that helped gel the team. This training as been on going and there is a great deal of support from AJ in many forms from supervision to forums to specialist talks to newsletters and training. Nothing is spared and they seem to go beyond what is required and go that extra mile for the client and us the support team. 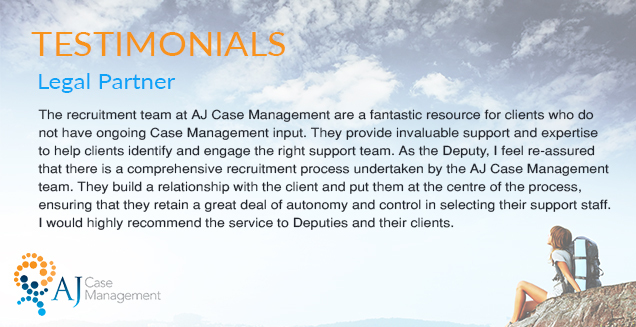 AJ Case Management stands out as No 1 in providing a bespoke service for their clients. Our team within the organisation is often described as the flag ship for the business. I am very proud of this along with my fellow team members. The standard of care we provide is extremely high. On saying this we are always looking in ways we can improve this and we are very fluid. We have worked closely with therapists and the client is encouraged to maximise their potential. These last four years have gone so fast and there are so many highlights. No two days are the same. I love my job. I love working for AJ Case. This is what care should be. I am very privileged to be part of it. It’s exciting for me because I am moving on to another package and I will be able to carry through my experiences of the last four years and feel I have the necessary experience to lead the team under the umbrella of AJ and my new case manager. “This is not your ‘average’ care job. I have recently began working for AJ case management supporting a 19 year old male who sustained a traumatic brain injury due to a road traffic collision. I have worked as a support worker for 2 years and worked for 3 different companies, many companies who provide support advertise that you can ‘change a person’s life’. This is true however the support worker needs to be given the right tools and amount of time to make this happen. I’d never felt able to make a real difference until beginning my position with AJCM. Although I am relatively new to this position the difference being made by being here is clear to see. The client I work with undertakes a lot of intense therapy; Physiotherapy, Speech and Language therapy, Occupational therapy, Assistive Technology, and Psychology. With support workers, such as myself, now in place and working alongside these therapists, the client is able to continue his therapy throughout the week and this makes a real difference to his rehabilitation. A huge amount of progress has been made, from communication to walking and I really feel as though me being here as contributed to this progress. What could come next is anyone’s guess and this excitement creates an urge to get to work in the morning. “Hello I first started working for my client in 2011. My initial role as Support Worker began with an intensive training programme for a period of three weeks, involving a multidisciplinary approach to the care and rehabilitation needs of my client. At the very start of working with our client he was supported by 4 to 1 (sometimes 5 to 1) for all aspects of his personal care, his personal team was deployed to assist personal care within his nursing home. The team followed the intensive therapeutic guidelines developed during the initial training programme, within 12 months we had reduced the support levels from 4 to 1 to 2 to 1 for all aspects of his personal care regime and day-to-day activities. Our client moved into his home in 2012, the team continued to follow the intensive therapeutic programmes and we were able to reduce his level of support again to 1 to 1 for all aspects of his daily routines. In October 2014 I was promoted to team leader, myself and my team have been able to bring in some new changes for our client to enable his independence and social development to progress to the next level, enabling him to experience a new exciting future. “I have worked with Alison McNamara over the last 8 years on many head injury and some lower limb amputation cases in her role as a Case Manager. Alison is professional and has shown a very good understanding of the unique problems that arise from head injury and she has particular experience of the difficulties in subtle brain injury cases. She has demonstrated on many occasions an ability to identify the needs of her clients and suggest solutions. She shows good attention to detail and has excellent organisational skills. Alison is personable and has good relationships with her clients who trust her. She is supportive, and has shown, on many occasions, her commitment to helping clients maximise independence and achieve the best quality of life. Alison has many good contacts in respect of therapists and other professionals. She has demonstrated an ability to recruit and manage care teams and multi-disciplinary teams of therapists in severe brain injury cases in many cases in which I have acted. She is a great advocate for her clients and their families and particularly when dealing with Primary Care Trusts, Social Services and the NHS. Alison has gone the extra mile in many cases in which we have worked together. “AJ Case Management is an efficient and organised company with a good clinical skill mix as well as experience in case management. Their strengths are in their professionalism and thoroughness; not to mention their passion and deep understanding of the complex issues raised in brain injury. “I’ve previously worked as a Team Leader with adults with learning difficulties, and this was pretty interesting and rewarding. When considering a role as a Therapy Assistant for someone who had severe head injuries, a quick internet search revealed that this was also a challenging and interesting client group to work with. I wasn’t certain how much my previous experience would help me, but it turned out to be very useful e.g. person centred approach, detailed record keeping, risk assessments, care plans, goal setting etc. I am also very grateful for working for such a fantastic company. AJ Case Management has provided everything that I could have wished for in my new role. This included an excellent induction programme, appropriate training and regular supervision. Their standards are very high and the level of professionalism is excellent. I have come to appreciate how important case management is to the clients and their families. We consider all the ways that we can meet the clients’ needs and to extend the range of opportunities that they can experience. Since leaving a rehabilitation centre, my client has made remarkable progress in a relatively short time. That’s not to say that there haven’t been challenges, and there have been times when I’ve needed to use all my experience and skills to find solutions to various issues. My contribution to my client’s rehabilitation is very much part of a team effort. Working with therapists has been fascinating and it is very rewarding to witness the progress that my client has made. From being more or less “institutionalised” and demotivated, my client now has a full and varied life, living in the community close to relatives and friends. “Previous to working with this client, I had worked in Supported Housing for over 20 years, in a range of roles and with a variety of client groups. However, this was the first time, I had worked personally with a client, who had an acquired head injury. I have now worked with my client, for just over 2 years, and been able to support him throughout his ever changing journey, since his accident. The client had suffered a traumatic brain injury 3 years previous to this, but shortly before my role started, he was awarded an interim payment which enabled the client to undergo surgery, and have a team of therapists to help support him, including myself. At the time that I took the client on, he had already had some therapy support from an Occupational Therapist and Psychologist and Case Manager, but had not had regular weekly support with his day to day living. This was a new experience and was quite a daunting and difficult time for the client, as he was unsure if this kind of support would work for him. Slowly, over several months, I gained the clients trust and worked with the client on various matters including his operations and liaison with Consultants, his settlement case, property and financial issues and vocational experience. I was able to support the client through some very difficult times, including operations that were unsuccessful, failed relationships, and naturally his own mental health and well-being. It has been a pleasure and a privilege to be able to work with such a client. I have learnt so much about his brain injury and the effect that this has had on him. Importantly, despite the clients difficulties, it has also taught me how resilient the client can be, and how his level of intelligence should never be underestimated. I have always supported the client in a very professional manner, whilst allowing him the space and opportunity to make his own informed decisions, but in the knowledge that he has had the support and advice to do this. Each week throws up different experiences and issues to deal with, but it is a fantastic challenge to be a part of this client’s progression.